There are many distinctive ciphers used by the Freemasons in times past. The Cypher of the Rose Croix (used in Tricky Masonic Cipher 1) is one of these old sets of symbols. Sometimes Masonic ciphers have keywords. A keyword is written into the top of the ‘pigpen’ grid, with two letters per box. The remaining letters are then written into the rest of the boxes in pairs. The second letter in each pair is encrypted with a dot. In the example below, LODGE is the keyword. Tricky Masonic Cipher 1. This cryptogram has been written in the Cypher of the Rose Croix, an old Masonic cipher. Tricky Masonic Cipher 2. This quote from antiquity still applies today! Tricky Masonic Cipher 3. 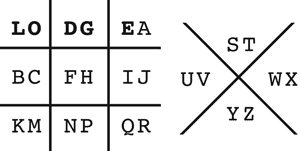 This cipher has a keyword — can you discover it? 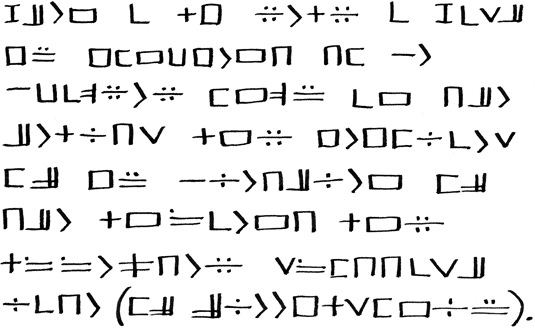 Tricky Masonic Cipher 4. This Masonic cipher also has a keyword. The fourth word starts with D.
The last letter is I. The first letter is K.
The first words starts with S.